A UK based gang has received cumulative sentences of 24 years jail time for a GBP 49 million money laundering scheme revolving around five pound notes, secret codes and text messages. On February 23rd the HM Revenue and Customs (HMRC) released an online statement, revealing that several members of a UK based gang have been sentenced to jail time for their part in the laundering of GBP 48.6 million for criminal gangs in the UK, including the UK’s most prominent marijuana smuggler, between May 1st 2007 and September 30th 2008. The investigation and prosecutions were centered around the website R2PK, which offered online money transfer services. The site was run by Tanveer Jaffery, the alleged ringleader of the laundering gang, who later came to be dubbed “Mr. Persil”. While the website provided a legitimate money transfer service to South East Asia, it was also used as a means to funnel large amounts of cash on behalf of organized criminal gangs throughout the UK. The HMRC revealed that the website, which advertised cash pick up services, would be used to organize a courier who would receive the money and deposit it across several local banks. The individual deposits were kept below GBP 25 000, in an effort not to draw the attention of tax authorities or arouse suspicion at the banks. Once the criminal gang who ordered the laundering was ready to receive their money, one of Tanveer Jaffery’s couriers would be dispatched to withdraw cash from a bank, in the guise of a typical fund transfer. 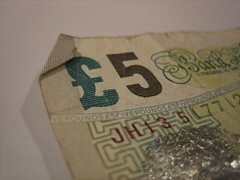 To ensure the relative security of the cash transfer, the gang would use codes generated from the serial numbers of random five pound notes. The codes were distributed to appropriate persons via text message by Tanveer Jaffery through a routed international mobile network. The bank note used to generate the code would also serve as a de facto receipt for the transfer. Tanveer Jaffery has been sentence to 10 years in jail. Naveed Ahmad, another organizer in the gang, was sentenced to six years. Mohammed Umer Farooq and Syed Yasir Abbas Shah, the two most prominent couriers in the operation, were both sentenced to four years in jail.